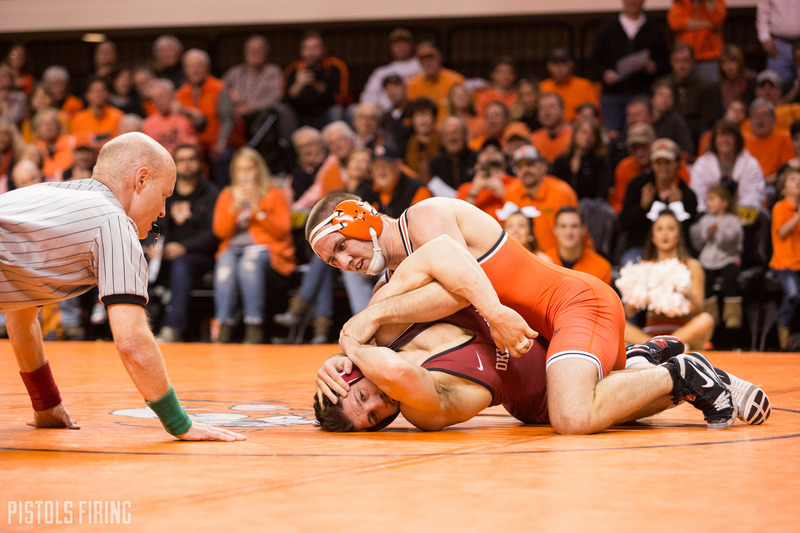 Ahead of the Bedlam dual here’s a look at five great moments in the rivalry. With Bedlam wrestling coming up on Sunday I thought I’d put together a list of some of the top Bedlam wrestling moments. Not necessarily the top five ever and not in any particular order, but these were all pretty great moments. I don’t think a person could script a better or more exciting debut for a true freshman. Kaid Brock was under a redshirt year and OU wrestling was looking fairly strong early in the season, they actually outranked OSU heading into this dual. Brock’s redshirt is pulled and he does this to the defending NCAA champ. The Cowboys went on to not only upset the Sooners, but to dominate the dual 37-3. It was 2013 — the last year that OU beat OSU in a dual — and both programs came into the season in the top five and had lineups loaded with All-Americans and NCAA champions. The Cowboys went to Norman in front of a sold-out crowd and took one on the chin, dropping the dual 16-15. In that dual, defending NCAA champion, Chris Perry lost to fellow NCAA champion Andrew Howe 4-2. Watching that match I sat back and thought “there’s no way Perry comes back and beats that guy in March”. A 4-2 decision is a fairly close score, but Howe physically seemed to overwhelm Perry and I personally just didn’t think it would happen. Perry proved me wrong, he completely flipped the script and dominated Howe in the NCAA finals to win his second NCAA title 4-0. Even dubbed by an OU fan in this story from The Daily Oklahoman in 1982 as “The greatest sporting event I’ve ever been to”. This moment is revered by many OSU fans as one of the greatest moments in Gallagher-Iba history. I wasn’t around back then, so I’ll let The Oklahoman describe it for you. This was the scene: Heading into the heavyweight finale, favored OU led OSU 17-14. And next up was the Sooners’ unbeaten (9-0-1), third-ranked Steve “Dr. Death” Williams, a three-time all-America, against Mitch Shelton, a baby-faced, 420-pound junior college transfer with a baby-faced 9-5 record. Dave Schultz started off his college career at OSU and later transferred down to Norman. He was a three-time All-American (once in Stillwater and twice in Norman) and NCAA champion at OU in 1982. He ultimately has gone down as one of the greatest Sooner wrestlers of all time. Schultz was an Olympic Gold Medalist in the 1984 games and lost his bid to defend that gold to Oklahoma State legend Kenny Monday in the 1988 Olympic trials. Monday went on to win the gold at those Olympics. In his corner? Sooner and rival Dave Schultz. I see it as a pretty cool “passing of the torch” type moment that really speaks to the character of Schultz. Schultz was tragically murdered by John Du Pont in 1996. Had life after college not went the direction it went for Jake Hager I probably wouldn’t have put this on the list. I think it would’ve qualified as a pretty standard Bedlam win, though OU (and this rivalry) was much better at this time. Most wrestling fans know who Steve Mocco is. He was an absolute monster heavyweight who transferred from Iowa to OSU. His transfer created arguably the best college wrestling team ever when in the 2004-2005 season he teamed up with Jake Rosholt, Zack Esposito, Johny Hendricks, Chris Pendleton, and others to dominate their way to a national title. This dual and win over Hager happened in his second season in Stillwater as OSU beat the then No. 3-ranked Sooners. The guy Mocco pinned here? He changed his stage name to “Jack Swagger” and made a career in the WWE.